My first day of kindergarten was the first time I would take a bus anywhere. The yellow bus picked me up right in front of my house. My mom reluctantly handed me off to the bus driver and away I went to school. The trip to school was fine. It was getting back home that was the problem. I didn’t know what to do. The bus driver drove and drove and drove as each child was delivered home. I ended up being the last person on the bus. I sat there, all alone and afraid. The bus driver asked me where I lived and I don’t remember what I told him. I remember being very afraid. I am sure I cried. Eventually we made our way back to my home where my mom was waiting for me. I am still not sure why this happened. I think I was too shy to tell the bus driver to stop. I remember the snack that first day. I remember being give Cheez-its for the first time for my snack and describing them to my sister later on after I came home. I thought they were the most delicious and wonderful food I have ever eaten. I was fascinated by thier size and the tiniest hole in the middle of them. I have a vague memory of playing Wallball and Four Square. I remember feeling out of place. I remember being shy with the other kids. I used to drive a Ford Pinto. In fact, it used to be Doug’s car. He actually gave me his old car when I learned how to drive. I think about that and it makes me cry. He taught me how to drive! He was the only person in the world who had the patience to teach a 15 year old girl how to drive. What a guy. Anyway, my pinto. It was orange. Bright orange with racing stripes. Yellow racing stripes. I bought two funny bumper stickers for it. One of them said, “0 to 60 in 15 minutes.” The other one said, “Warning, this car explodes on impact.” Yes, even as a teen I had a sick sense of humor. But then again, someone actually made the bumper sticker so I guess I am not the only one. I loved it when people pulled up behind me. I would sneak a look in my rear-view mirror and smile at the reaction. They would usually be laughing. 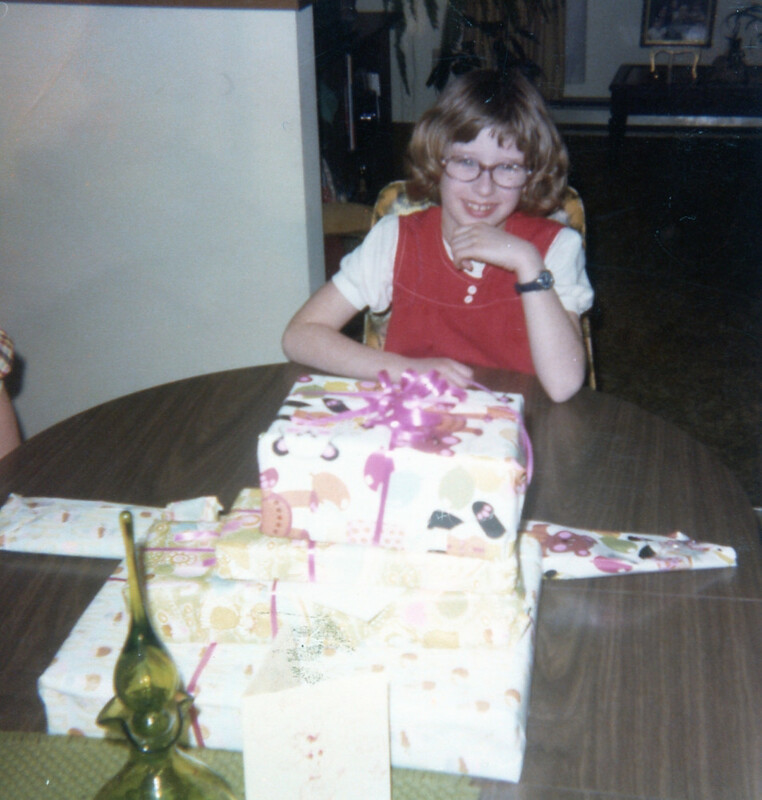 I don’t have any photos scanned of my old car so, instead, here is a photo of me on my 7th or 8th birthday.